Even if you don't know exactly where it is, or how to get there, chances are you've probably at least heard of Tin Cup. It's a breath of fresh air, photogenic, pastoral, and the quintessential "get away from everything" kind of place that is fun to find. 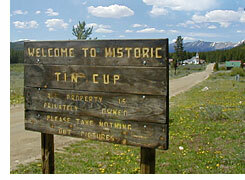 But contrary to what you might have thought, Tin Cup is not a ghost town. This misconception is probably a result of the fact that almost all local residences are very old cabins that have been restored to original condition—giving it the appearance of a town that has not changed in the last 150 years. 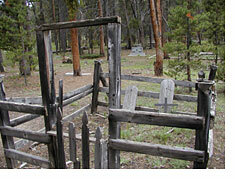 The western flank of the Continental Divide had for centuries been home to the Ute Indians. Captain Zebulon M. Pike reportedly reached the area in 1806 while exploring territory acquired by the United States in the Louisiana Purchase. But it wasn't until the 1850's as prospectors were returning east after being discouraged in efforts to find their fortunes in the California goldfields, that the Rockies began to attract non-Indian visitors. James Taylor, an 18-year-old Georgian is the first reported white man to settle in the Taylor Park area, which makes up most of the Tin Cup District's land area. There are only a couple businesses in Tin Cup, a small store/gift shop in the middle of town, and Frenchy's, a small log cabin restaurant (with a colorful past!) where you can enjoy a great burger, or dessert. They're not always open; but the sign out front will clearly let you know whether they're Open or Closed. 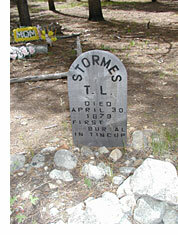 Take a few minutes to visit the old cemetery. It contains Protestant, Catholic, and Jewish sections. Tin Cup can be accessed from Cottonwood Pass west of Buena Vista, from Taylor Canyon east of Almont, and from the beautiful Cumberland Pass which exits from the north end of Pitkin. 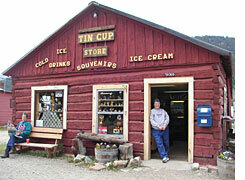 Tin Cup has a colorful past, and for an excellent account of the history of the area as well as some entertaining reading, we recommend you pick up "Colorado's Alluring Tin Cup" by Conrad F. Schader; it provides an entertaining account of the Tin Cup District, its settlements, people, and mines. The book is available in the small store across from Frenchy's, as well as many book stores throughout Colorado. 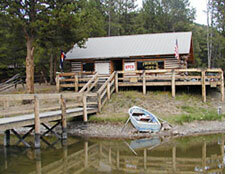 Back to the Pitkin Colorado website and other adventures!